If you're driving in California, you don't have much choice about what kind of fuel you buy or how dirty it is—a troubling issue, considering that the transportation sector is the largest source of pollution in California. But hope lies in California's innovative policies—including limiting pollution from transportation fuels under the state's cap and trade program. We just need you to help support it! 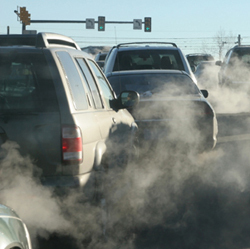 Don't let oil companies derail California's clean air policies. Tell your state legislators that you support including transportation fuels in the state's cap and trade program. I'm writing today to ask you to strongly support staying the course on transportation fuels in California's cap and trade program. Cap and trade, along with other climate change policies to cut carbon pollution and incentivize the transition to a cleaner transportation sector, is sorely needed to protect the health of Californians. I understand that you have signed a letter favoring a rollback of AB 32, but I am asking you to rethink your position. The transportation sector is the largest source of pollution in California, contributing to close to 70% of the smog-forming gases and 40% of our state's climate change pollution every year. Consequently, the current transportation system is responsible for a significant portion of the negative health impacts that citizens suffer from, in addition to causing energy vulnerability and dependence that threatens economic stability, and contributing to climate change that threatens the future of our state and our planet. New analysis by the Environmental Defense Fund and the American Lung Association in California shows that cap and trade and California's Low Carbon Fuel Standard offer impressive economic and societal benefits to the state. By 2025, these are expected to include: * Savings of $8.3 billion in pollution-related health costs * Prevention of 600 heart attacks and 880 premature deaths caused by air pollution * Prevention of 38,000 asthma attacks * Prevention of almost 75,000 lost work days * Saving of approximately $6.9 billion from increased energy independence * Savings of $7.9 billion in social cost of carbon damages It is clear that keeping transportation pollution in cap- and trade greatly benefits California communities. Please stand strong in favor of these policies, and oppose any efforts to weaken them. Thank you.